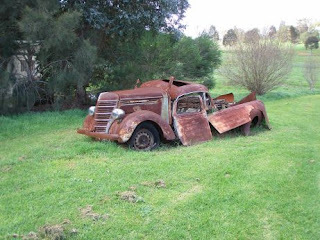 I have been to Geelong and am back again. 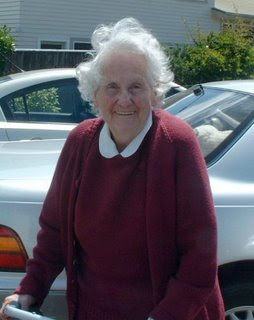 Didn't take my camera so no pics but I went to Geelong forum and it was really lovely to catch up with so many people. Really busy - I flew in on Wednesday afternoon and there were 3 ladies waiting for me - I had to open my suitcases and unpack my 16 boxes..... Thursday was non stop and Friday and Sat morning very good. When I arrived in Melbourne I got a call from Qantas to say my return flight had been diverted through Adelaide because of the AFL finals which meant travelling with either very happy or very sad but mostly well oiled Adelaide passengers and sitting on the tarmac for an hour or catching a later plane both of which meant missing the rugby games so with a bit of sweet talking I was changed to the 3.10pm flight and got the very last seat. What this actually meant was that I had to pack like crazy, finally getting away from Geelong at 1.15pm. Got to the airport at 2, got stuck in a queue trying to pay for the petrol top up, dropped off the car but there were no trolleys so I had to piggy back 3 suitcases to check in, waiting in a queue at check in, finally getting into the Qantas club at 20 to 3, collecting a glass of champagne and a plate of salad, phoning Ian but being cut off as the mobile ran out of money, and sitting down to relax just as the call for the plane came up. I stayed to finish then took off for the plane (always at the furtherest away spot), decided to have a toilet stop and seeing the long queue for the ladies, hobbled into and out of the disabled toilet, ran to the plane - last on, sat down and the hostess announced that we would be late leaving beacuse the hot food had all fallen off the trolley and they had to wait for more.....Murphy's Law once again. However the upshot was that I got to watch a great All Black's game and a very pedestrian Wallaby game and came back home to see Fiji have a great game against Wales. Here they are celebrating. The serious stuff starts next weekend with the quarter finals. We think we might need afternoon naps with the games being in the middle of the night. All unpacked now and starting to think about what to send to London for the Knitting and Stitching show at Ally Pally - the onahead boxes go on Tuesday so there is no rest for some. I have a few new goodies to take with me which I hope people will like. Lots to do tomorrow but it is a holiday here for something of another. I did get a little bit of stuff done in Geelong - mostly trying to get my embellisher sample book underway for taking to London. 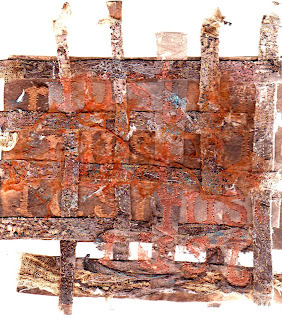 People seemed to enjoy my Book of Ink - I shall be working with the twinkling h20s this week. I shall read the QA on the plane - I haven't even had time to open it up yet but I expect it will be good - they always are. We are having storms and rain here - Ian is waiting to oil the decking but not this week. And it is pretty cold. The wash for the front fence has been ordered so we can paint it before the iron railing men come before we go to UK. I am packing and stuff for Geelong as I go early tomorrow morning. If you are coming to Geelong I will be there from Wed night to Sat lunchtime. Trading in a new place so don't go looking upstairs. Over where the masseurs were last year. Ian is not going so contrary to what some people think, he will be flat out here. We have a little drama - again - with one of our shipments but I won't say what this time. All too frustrating sometimes. 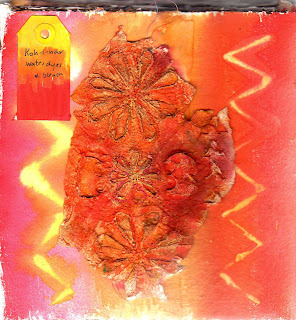 Jacinta is taking me an embellisher to Geelong so I can play and work on getting my sample book together. And I shall have my ink book with me as well. By the way - that grape is still soaring as we watch - obviously it's happy with the rain and one of the others is on the move as well. 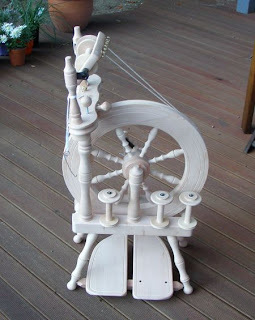 I have had my own excitement - my new spinning wheel which Ian has spent the best part of the weekend putting together for me. I got rather lost after the first 2 screws went in. 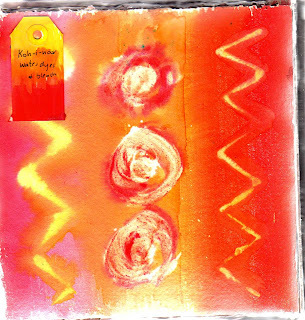 I haven't spun for a long time and want to spin some textured everything. Not the lovely fine even stuff I used to do. This is a double traveller from Ashford. So exciting but I probably won't be able to do much before we go to London early October. I finished the article I was writing about the Flower Stitcher foot and all the samples and decided to make a wrap to put the samples in. This might be a new way to actually keep things together. It is so annoying when you can't find something. 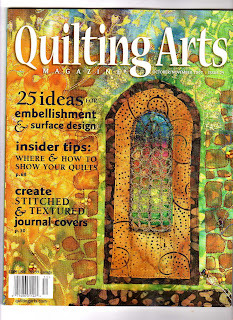 The cover is made on the embellisher and I used some of the Sari fabric scraps we got in this week, before there are none left. I also got my very own printer/scanner/copier yesterday - an Epson. They are ridiculously cheap these days. Started working on my Digit-wise module 4 when my laptop threw up - it needs more ram so it is off to hospital tomorrow I hope. But I did do a little digitizing in frustration. While I was searching for something else I found this little bag I made when I was working on the top which is what the piece at my header is. (now changed into a long piece) The bag body is made the same and the outer is worked on Romeo using the FS threads. We watched the rugby last night at Bruce and Kazuko's. It is later this weekend and we nearly all fell asleep. The Springbox and the English may have won but not impressively. 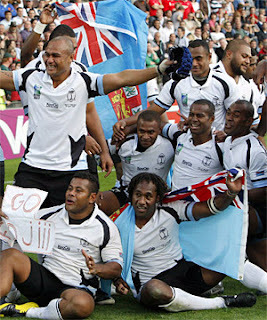 In fact we were gunning for Tonga - a very spirited game. Off later tonight to watch the Wallabies vs Fiji and the ABs vs Scotland. Luigi grows lots of fruit and stuff in his garden but especially lots of grape vines. He makes his own wine and we have shared many with him - from good to garden variety. This year he gave us 4 cuttings and this one is racing away - you can almost see it growing as you watch. We weren't going to have a garden in this area but the grapes chose otherwise. Hopefully it will stay alive and we won't be in trouble with Luigi. And we will pick lots of grapes but not make wine. I have planted some pansies to keep the vine company. Seem to have lots of parcels in this week - big shipment from India with all the yummy sari stuff and another today with lots of goodies including 6 different flower (yes flower) sequins. Ian helped the delivery guy lift it all off and one box weighed 80 kilos, can you believe? I found it hard enough lifting the inside boxes out. I got a selection of 10 different colours of glass beads just for an extra. They have metallic inside. But I am especially pleased with the sequins. Beautiful day in Perth today - too hot for socks and shoes. Will have to find my sandals. 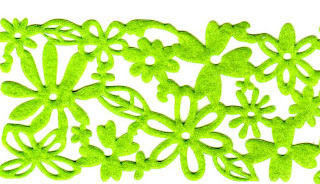 I am writing an article on the flower stitch foot so am doing some more samples. Might make a book to keep all the samples in. I got to Calligraphy just in time to do half a row of letters but I have been practising during the week this time so I surely can count that in as well. I will miss the last week of the term next week as I will be in Geelong but I am determined to practise until the next term starts in November. I don't expect to get very good but I do have some plans for what I might do. 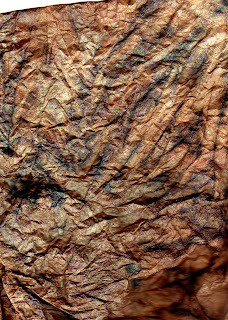 As part of my Flower series (which is part of my Kimberley Dreaming series) I found a wonderful wooden printing block (some of you may remember I went out to do some food shopping and came home with a pile of blocks instead) with flowers so I used water soluble paper to make a casting and painted it up with the koh-i-noors again and rubbed the tops of the petals with moonshadow powders (yes they have wonderful 2 tone mica powders as well - I thought I would test them out before ordering them and they are great) and stitched a bit. I am stashing up various bits and pieces related to the different themes I am working on. Not very good at working on one thing - I guess it is because the brain hops around too much. I have also begun a sketchbook inspired by a bottle of red - it's not ready for showing yet. I found some wonderful napkins a while back and have been waiting to use them. Tonight I am cooking a lamb tagine with coucous - preparing for our visit to Marrakech which is not too far away. Because of this we will miss the play we are supposed to go to tonight but maybe we will just vegetate instead. Thanks to all of you who write comments - I do appreciate it. Glad you like the Paris Breakfast link - it's wonderful isn't it? 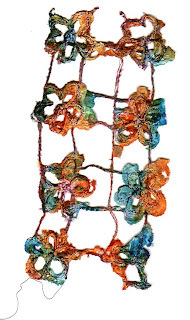 Ian has been flat out this morning adding all the Sari ribbon and fabric bits to the catalogue - in Fab Bits. He hasn't loaded the last pics yet as the many boxes of books arrived. 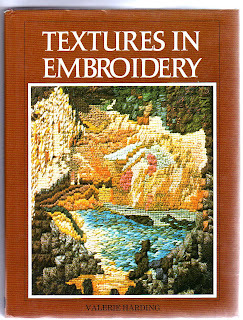 Including Hot Textiles and wow this is a great book - have had a quick read whilst having my morning coffee. It will be on the website soon and I think we may even have got it before anyone much anywhere else has it. There are 3 other new books so check it out later on. This one will be a winner and I am glad I doubled my original order. You cannot see much of the floor in our kicthen at present while I am packaging and unpacking. It's always exciting here when the parcel man comes. I found a lovely blog today - Paris Breakfasts - I have added it to my links - do check it out. Just a lovely blog to visit. Today I cleared the kitchen area in readiness for the parcels which I knew would arrive and I was not disappointed. Most of it is unpacked and away although I have been creating scrim bundles for seemingly hours. Then we got this wonderful huge parcel from India - these people are wonderful to deal with and I love the way the shipment comes all wrapped in a sack. Sometimes I like the scrim under the wrapping paper. Just in time for Geelong forum - sari ribbon bundles, sari fabric and wonderful recycled saris. Looks like I have a lot to do tomorrow as well as packing the stuff to go on ahead. Grant tells me he is sleeping with my next big roll of scrim which he says has grown since the last one I had sent to him. I owe him more wine and food for this one. 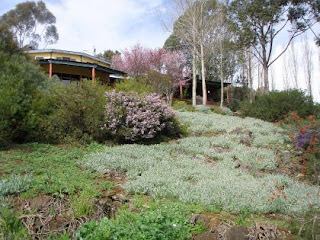 Today has been a bits and bobs day - spent the morning packaging and sorting and tidying up a few loose ends - I have to send the onahead stuff to Geelong on Wednesday and think about what we will send to London. I have been out gathering a few plants for the garden. 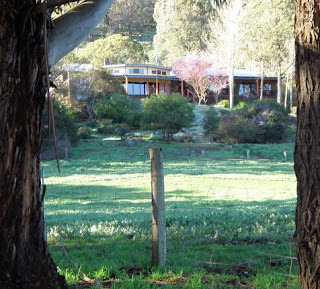 The iron railing for the front fence is being made in the next three weeks so we will have a fence and a gate for while we are away - we will be on bread and slops for a while but it will be lovely. 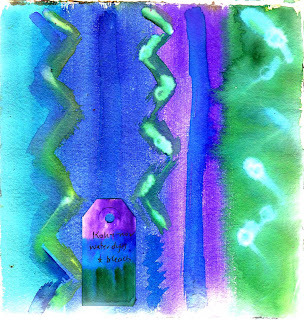 I have been working further on my Ink Book and these are the Koh-i-noor water dyes with bleach pen over some sections. These dyes have lovely strong pigments and are great for travelling as they are compact and fit into your handbag. 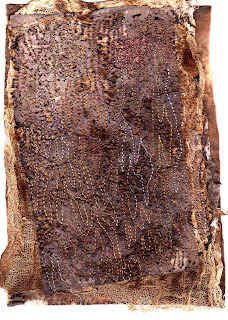 Here is the piece from the other day - I have cut it and woven it and stitched it onto a background of felt (remember a lot of strong walnut ink went for a spill) - the scanner has cut off the hanging sides but I have stamped RUST in places and also on lightweight Lutradur, stitched and added some extras such as Gossamer Fuse and chiffon scarf and Treasure Gold and then used my heat gun. You might be able to see the stitched and zapped letters at the bottom. Actually if you click on it you can see what it really is like. Haven't done anything with the Tissutex yet. Doreen sent me some wonderful lime green flowers in exchange for the orange ones I have - thanks mate! One of my favourite colours. Last night we went to the Australian Brandenburg Orchestra - they don't tour very often. The guest was Hiro Kurosaki - what a wonderful violinist. Plus he talked about the music. I gather he usually does. He was telling us that all music has a story not just the pieces with words. I wish he could have come and talked to my students when I was teaching high shcool music - would have helped to reinforce what I used to tell them. We watched the rugby between the Springbox and England this morning - the English got whitewashed. Tonight the ABs play Portugal and the Wallabies Wales - that will be interesting. This morning I went to calligraphy and I think my letters are slowly improving. It seems to me that I will have to practise forever and never be much good. At least I didn't make any nasty splotches this time. It all looks so lovely apart from mine. 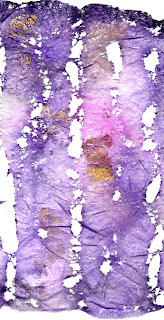 I have been layering up felt, scrim, lutradur having painted it all with walnut ink. I thought the felt was kunin but of course it was not so it didn't distort much when I heat gunned it. I am going to cut and weave it and then print text over it. Click on it and you can the detail. Last night I had a distaster in that I spilt a full jar of a strong walnut ink mix and a near full Ethereal Emerald Moonshadow ink - all over the floor and on things and everywhere. I mopped a lot up with tissue and then Tissutex. I know why I love Tissutex - it is fibrous and it is strong. 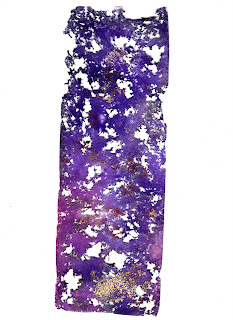 The scan doesn't show as well as it might but the mica and colour has come up so well. I will decide tomorrow what I will do with all of this. Because I was busy cleaning the floor I missed the Chaser but I got to see it on line this afternoon. What a waste of money all that security was when they didn't even manage to check a hoax. This morning I carried on my disasters by spilling a tub of blueberry yoghurt all over the kitchen floor, It looked a bit like projectile vomit and spread everywhere. I shall try harder tomorrow but we are just off to Spaghi for now for a lovely Italien meal. The parcel postie came really early this morning and in with the parcels was this copy of - I think - Val Campbell-Harding's first book. Written in 1977 and nearly all black and white. 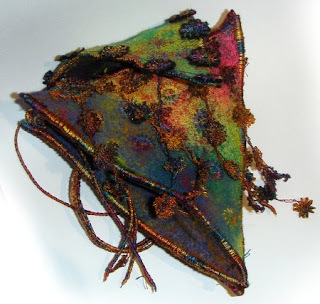 Chapters include Sources of Ideas, Threads, Stitches, Fabrics, Raised Effects, Adding Objects. I am sure it will be a great source of inspiration and I am really thrilled to have found it. Sort of completes my collection - I think! Flicking through I can already glean a few new takes on things. Val was so innovative and so much of the stuff appearing around the traps hasn't a hope of reaching her heights. It is raining this morning so this is the time of the year for contrasts - enjoy it before it is all hot hot hot and mono-weather. An appropriate man came to measure up for a quote for the iron railings on the wall spaces in the front of the house, and the skip is all filled but we can see we need a couple more. We have a lovely clear area ready for good soil and planting. 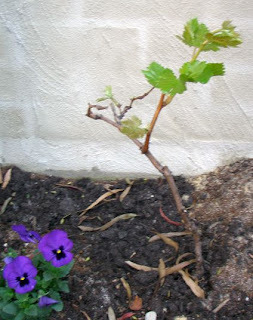 I planted some big pansies on the weekend to keep the grapes company (they seem to still be alive) and am off to get some more. Plus a heap of pots to fill up. In the studio I have been painting up Tissutex and Lutradur for my Text Book. This is for the first section of my next book. We are also publishing a Playways on the Net book - early next year - featuring some of the wonderful work of students enrolled in the course so we are always busy. I do believe that this month's promotion and specials will be up today. With us it is always a wonder and a surprise to find out when! At least we try to do really good monthly specials. I have made a little book from the pieces I painted up yesterday. This fabric is wonderful. 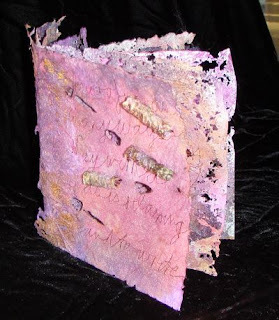 I have stitched on the cover (since I am working on a word theme) and applied foils and joined all the pages together with the wood burning tool. Made some beads and applied them with the same tool. 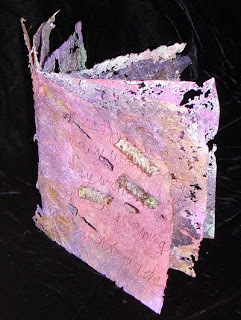 It has so much potential - I think I can see it replacing tyvek for me in some of my work - great to stitch on and I love the translucent effects of the pages. 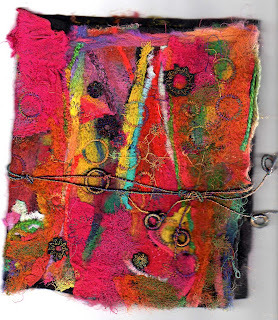 I have used all three weights and Gossamer Fuse and created lumps and bumps in some of the inside pages. I am teaching a workshop in Wanaka at the end of November on Postcards and I have always just used craft vilene for these and bonded two pages together to finish but now I am thinking I might play more with the Lutradur idea for some postcards. Not all - just a special one or two. 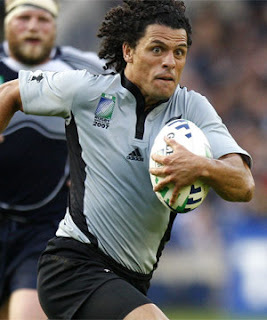 Well the rugby started well for the All Blacks with a good win over Italy - it pays to show respect for the haka. Next week they play Portugal - bit silly really. They should have 2 tiers or something. I wouldn't be happy being a minion and being thrashed by the top teams. Aust did that to Japan and I must say I nearly fell asleep but then we had watched 3 games. Beautiful day in Perth today - Ian is digging dirt and carting it into the skip and I have been further playing with Lutradur. I love the fact that it is translucent and this little piece has been printed on, burnt with my soldering iron and the flowers I applied with the soldering iron. I am making a book with yesterday's pieces - be back with that later. I have also put together an intro kit with ideas and instructions for $6.50 which Ian will add to the web pretty soon. I found that when I burnt out the holes yesterday they are brilliant to stitch over - you don't need a hoop or any stabilizer. I don't see this stuff as a backing of any sort but as a fantastic fabric all on its one. Just great for journals and 3D things. Back to work - I think it is my turn to help with the shovelling. Bruce and Kazuko bought themselves a massage chair which we all had a go in last night. Very nice indeed. The tandoori lamb chops were a great success. I had to hunt out my pestle and mortar to work the marinade. A recipe to add to my stash. I have painted 3 diferent weights of Lutradur with Dye-na-flow and attacked each with my heat gun. Top one is the 30gsm - the thin one and I have also ironed on some Gossamer Fuse and gold foil. You can see how lovely and lacey it becomes and will be good for layers. This is the 70gsm weight with the same treatment. You don't have to make holes in it of course and you can use your soldering iron to burn the edges. This is a good weight for journal pages. This is the 100gsm - the heavyweight Lutradur. 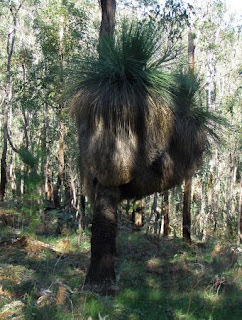 It is a little like pelmet vilene but in Australia - not as expensive. It would be great for boxes and structures and I like the texture and feel much more than Timtex which I don't use. Because I am working on a theme of Words I have also stamped words all over the surface before I applied the heat gun. I will print on some tomorrow as well. But what I want to do next is to layer it up and stitch on it. Lutradur has many uses. Transfer paints will work very well but I wanted to use Dye-na-flow this round. I sprayed the surfaces with water before I painted so the paints would be thin and move around easily. Because people have been emailing and asking me, I am putting a Lutradur Intro pack together with a set of notes so you can try all three and compare them. Should be ready next week. 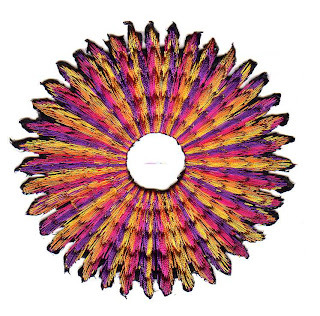 Wow - I mentioned Hot Textiles yesterday and I have had to order another round as I have had so many preorders. It is going to be a great book I think for all of we who like to experiment. We got up early and watched the repeat of the first game of the rugby. France lost to Argentina which was a bit of an upset. We have been shovelling away at the dirt and filling the skip up and getting ready for our exciting evening of rugby. I have prepared Tandoori llamb cutlets as my contribution for the bbq. Finally many thanks to my Miss Marples and Inspector Pierrots out there who are working on my behalf. I am eternally grateful to you all! I have finished the little embellisher flower stitcher bag I was making. The fabric is wool tops on scrim and I have used the back side as the top and stitched a lot of flowers on the surface. It has got flowers stitched on Romeo on 2 sides. It is made from 5 triangle pieces. A bit of fun. 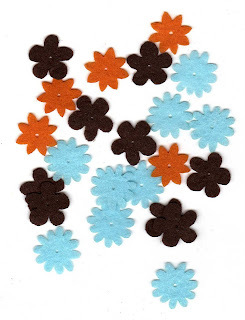 The last shipment of flower stitch feet sold out very quickly and a new lot arrived today. Obviously lots of people have been inspired to buy one and play with it. You have Val Campbell-Harding to thank for the fact that I have this foot and enjoy playing with it. The foot is interesting on loose weave fabrics too. We are having rain glorious rain today but hopefully it will stop a little tomorrow so we can fill the skip which arrived today. They were out of small ones so we have a bigger one to fill - yikes! Leanne will be pleased to hear that this time they have dropped the end so we can run the wheelbarrow up instead of lifting it full of dirt. And we will be building up a genuine sweat so we can enjoy the exciting start of the Rugby World Cup which starts tomorrow. Three games for us to watch - France vs Argentina, NZ vs Italy and Aust vs Japan. A bbq at Bruce and Kazuko's (they have Fox Sports) to be fitted in during one of the games. A nervous 6 or so weeks for NZ - can the All Blacks do it this time? Apparently there are some NZers who don't care about the rugby - shame...... it's our national sport and what we grew up with. I found these little felted flowers at my local scrapbooking shop where I sometimes go to fossick around and I seem to regularly collect flower things to use in my work. These were in a tin and I was wondering how I might use them but the embellisher just adores them I discovered. 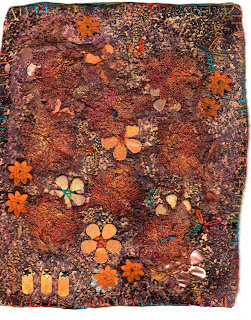 This piece below I have shown before - it is part of my Kimberley Dreaming series but I popped a few felt flowers on and whizzed around with the embellisher - you can see the orange ones quite well. And I have layered them as well for a bit of dimension. I think you can buy lots of prefelted shapes but some of them look a bit daggy so I shan't get too carried away. It's just cheap and nasty felt but great potential. I got word this morning that lots of new books are being unloaded at the wharves in Sydney - not that they can go far with the happenings over there this weekend. Books such as 'Hot Textiles', 'Print Pattern Colour' and 'Bags with Paper and Stitch' are three which will be here Monday week. 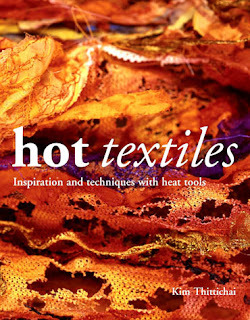 I am particularly looking forward to seeing 'Hot Textiles' after reading Kim's article in Workshop on the Web this issue. I have been off playing with Lutradur today - well painting the 3 different weights we sell and also painting Gossamer Fuse so I can do a bit of combining and stitching and heat gunning tomorrow when I am not helping cart dirt. I have also just received an order of Blending Chalks which I want to play with on Tissutex as well so watch this space. 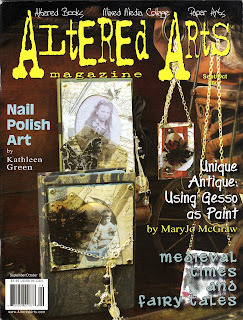 Below is the latest issue of Altered Arts which arrived today - there is an interesting article on using Gesso as a paint which I like to do on my old books - I have been off buying unloved books to work in. There is also an article on a Medieval theme. Interesting stuff. 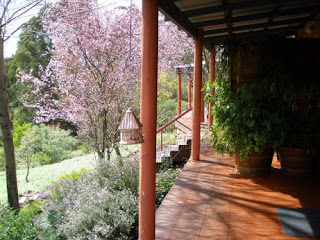 Here are some of the pics from our little sojourn to the south west. 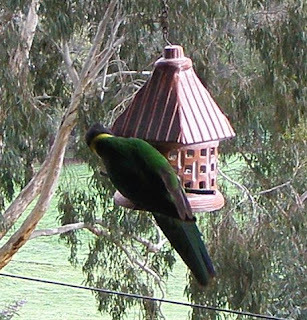 A parrot - I thought it was a 28 but on looking in the very comprehensive bird book and seeing so many types of parrots I am now not sure. Anyway they came to eat regularly on our balcony. 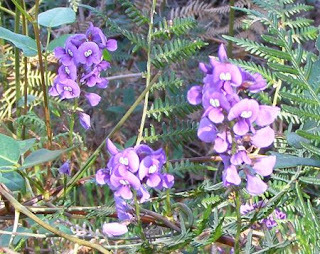 some flowers - like the colour - it is springtime here. 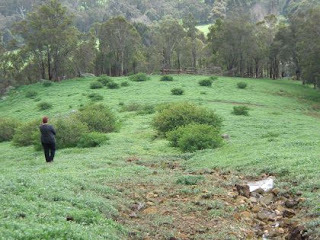 We went for a walk up to the 50acres of wildlife sanctuary and here I am walking down again. Steep up and down. 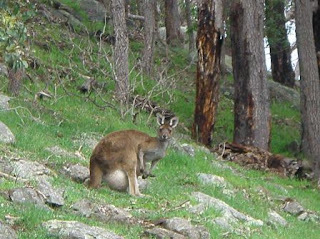 Hello from some kangaroos - there were loads and they stop and stare at you - very laid back. Beautiful day in Perth today - off to get some stitching and stuff done. The ACO concert was brilliant last night - the guest was Charles Lindberg trombonist. Ian seems to have done something with all the photos from the weekend and he has disappeared for a while so I thought I would share the lovely tile I bought in Balingup on the weekend. There was a decent sale and I bought this tile and a wonderful patinated key - I am sure I will be able to use that somewhere. 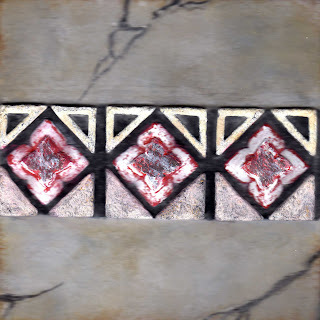 I did like this tile though. 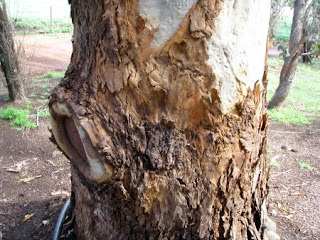 We went to the Blackwood River between Balingup and Nannup - closer to Nannup to a farm called Tathra. Lots of places in WA have 'up' - it stands for water. Nannup is quite a settled small town which closes for the weekend (ie I could only check the emails on Friday but not on Sat and Sun) but Balingup is more of a little gem in that it doesn't have a bank or important things like that but it it open 7 days and has a fabulous cafe/providore called Taste of Balingup and lots of interesting little shops. 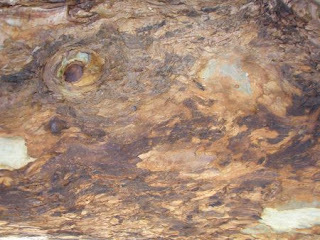 I think Balingup was the original home of the magic mushroom. I am not sure if people still go chasing magic mushrooms any more. Sunday was a glorious day weather-wise and everyone was out and about. We had a wonderful time and the relaxation is always very good for us both. It was a mobile no-go-zone all around the area which doesn't really say much for Telstra. Ian read and I read and stitched and knitted and drew and wrote. Looks like I need a holiday when I get back but it is always very relaxing. When we are here we just work 7 days all day - business is harder work than people think. A couple of weeks ago Luigi and Martene gave us grape plants which we were supposed to plant immediately. They had been nurturing them for us. This morning we thought we had better get into action and plant them so they are all safe and sound in the ground in their new home getting lots of sun and we are off the hook. We have ordered another skip for this weekend to be delivered up the lane so we can fill it up with dirt. That's when we are not getting ready for the start of the Rugby World Cup. Only 3 days to go! Off to the ACO tonight for another wonderful concert for sure. 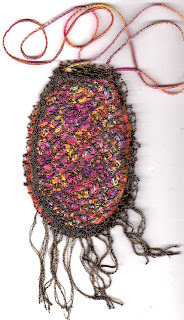 Doreen - the threads I used for my samples were the 4 strand cotton which is our own one. It wasn't what I was planning to use - I had planned to take the Valdani perles but of course I forgot and these were for a diferent project I started in Wales which I thought I might finish or further advance on. I did the latter. 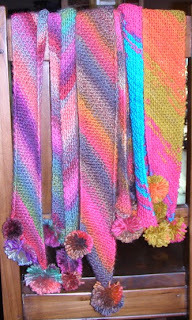 But I did finish my 3 knitted scarves and make the pom-poms for each end. One for Kazuko, one for Bev and one for me. They were fun to knit - on the diagonal. 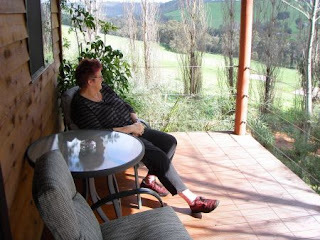 I will have some pics to show of the area we went to, later on, but we had a lovely relaxing time which is the idea. 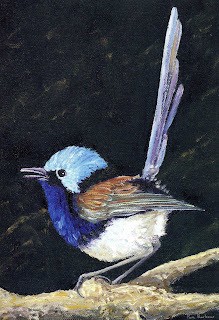 We saw a blue wren one morning but didn't have the camera so this was a card I bought to send to my mother. Naturally the male has the wonderful full on colour - it's almost lapis lazuli. 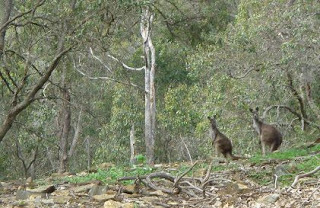 We also saw lots of kangaroos on the farm where we stayed and Ian got himself cornered by some very friendly heifers. We had a great view and at sunset sat out on the balcony with our red wine watching the white rabbits and multiple bird life. Back to business - Ian does his sums at the end of the month and even he has been impressed with our 3 big whizz out the door this last month - the khadi sketch books (I am in the process of negotiating my next shipment) and the 2 books - The Painted Quilt and Visual Language. 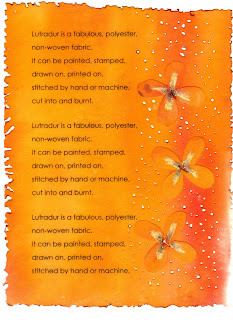 I have discovered that the khadi book pages are also great for stitching on - that's a big plus. Seems Lutradur is still a big buzz - it features in Workshop on the Web as well as Cloth Paper Scissors. I am enjoying having fun with all three diferent weights and also with Evolon which feels like a suede to touch. Do go visit our website and click on the smiley man on the front page - a new season has begun and these are our famous bottle brushes. I managed to complete 4 of my TAST samples over the weekend - 2 to go to be up to date. It helps if one actually remembers to take threads and shisha mirrors! We had a great weekend - very relaxing and I will have some pics and stuff tomorrow. Back at 1pm today and straight into work here.